Are you ready for a melt-in-your-mouth Beef Tips Recipe? Look no further!!! 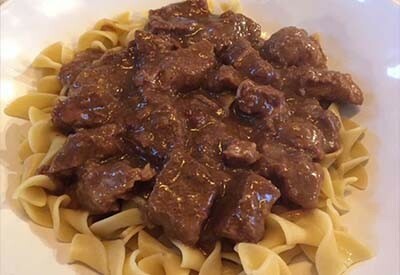 Melt-In-Your_Mouth Beef Tips over noodles. Absolutely delicious!! One of our classic, cold weather, go-to recipes is Beef Tips. They are so versatile as you can serve them over noodles, mashed potatoes or rice. In fact, they can also be a stand alone protein main dish and be served alongside a salad, broccoli, roasted red potatoes, or anything else that you enjoy. The best part of this recipe is that the beef actually melts in your mouth. They are so tender and the gravy provides the perfect rich flavor to enhance each and every bite. If you use your Instant Pot it can be ready in less than an hour from start to finish. However, if you haven’t yet invested in the Instant Pot yet (what are you waiting for?? ), you can still cook this in your Crockpot and it will be ready for you to devour when you come home from work. 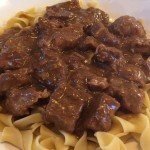 However you choose to prepare the Beef Tips, one thing is for sure, you might want to double the recipe as your family will be begging for more! 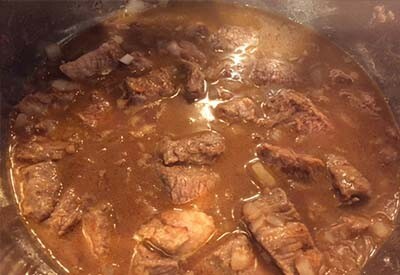 Brown your beef tips in olive oil until brown on all sides before adding the liquid. Once the time expires, thicken sauce to desired consistency. 1. Add first 6 ingredients in a large bowl and coat well. Heat 1 tablespoon of olive oil on the saute mode of the pressure cooker/skillet. Brown meat on each side and remove to a plate when done. 2. Add additional olive oil and sauté the onions until translucent. Add garlic and saute for 1-2 minutes. Add red wine or beef stock to the warm pot and deglaze the pan. Turn the heat off. 3. Add the meat and remaining beef stock to your pressure cooker/crockpot. Instant Pot: set on Meat/Stew for 30 minutes with vent sealed and when finished allow for natural pressure release. Crockpot: Heat on Low for 6-8 hours or High for 3-4 hours. Serve over noodles, mashed potatoes or rice. Or, use as the main protein dish. Add first 6 ingredients in a large bowl and coat well. Heat 1 tablespoon of olive oil on the saute mode of the pressure cooker/skillet. 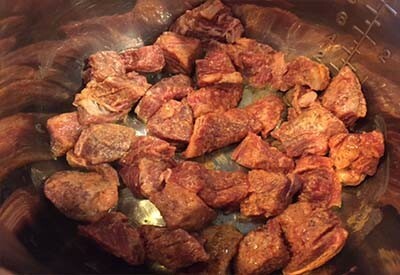 Brown meat on each side and remove to a plate when done. Add additional olive oil and sauté the onions until translucent. Add garlic and saute for 1-2 minutes. Add red wine or beef stock to the warm pot and deglaze the pan. Turn the heat off. Add the meat and remaining beef stock to your pressure cooker/crockpot. Instant Pot: set on Meat/Stew for 30 minutes with vent sealed and when finished allow for natural pressure release. Crockpot: Heat on Low for 6-8 hours or High for 3-4 hours. ← 3 Simple Ways To Eliminate Clutter From Your House – And Simplify Life! Typically if you double an Instant Pot recipe the cook time remains the same. The only time I increase cook time is if whatever I am doubling is smashed together or frozen in a solid clump. Hope that helps. If you double the recipe, do you need to add more cook time?